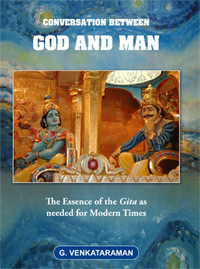 This musing series by Prof. G. Venkataraman is on the 'Essence of the Gita'. In this modern age of rationalism we tend to refuse to accept anything that is not offered on the platter of scientific approach. And that is what makes this presentation by an eminent scientist a work of unquestionable relevance. He has infact authored a comprehensive book on the Gita: Conversation Between God and Man, which is popular as much for its profundity as its lucid and simple-to-understand conversational style. At the outset, I offer my humble pranams to Swami and express my gratitude to Him for guiding thus far. I seek His grace and blessings to navigate through the difficult topic I intend to cover today. We think of Prasanthi Nilayam as an ashram in a village called Puttaparthi. In a purely geographical sense that perhaps holds true. But what Swami wants is our Heart and Mind to be the abode of Peace or Shanti so that the whole world transforms into Prasanthi Nilayam. It is help us transform the world in that manner that He came donning the human form, and it is in this context that He is teaching us all the time about Mama Dharma, which He taught earlier as Lord Sri Krishna. So we resume our explorations of the Mama Dharma aspects of the Gita, taking a brief look into Chapter 6 this time. I started out by drawing your attention to the fact that adhering to Mama Dharma is the essential or the core message of the Gita. I then led on to the Second and later Chapters of the Gita and while dealing with them, I pointed out the following facts. a) Life is a series of actions. 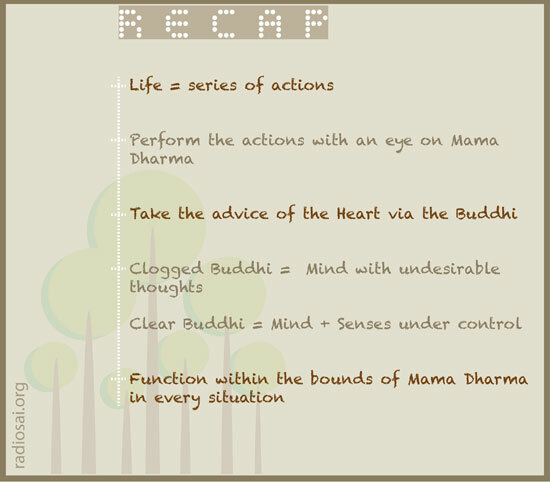 b) Actions must always be performed with an eye on Mama Dharma. c) In this matter, we need the advice of the Heart, which is conveyed to us via a pipeline called Buddhi. d) The pipeline called Buddhi can easily become clogged if the Mind is allowed to be full of undesirable thoughts. So to keep Buddhi in shape, sense and Mind control are essential. e) One does not have to withdraw into the forest and become a recluse in order to do all this. In fact, Krishna wants us to be very much in the situation we are placed in by Destiny and function within the bounds of Mama Dharma in that situation. Along the line, I also drew attention to the importance of Mind and sense control. 1) What exactly is meant by Meditation? 3) What characterises a person who meditates intensely? These questions are important and need some examination. 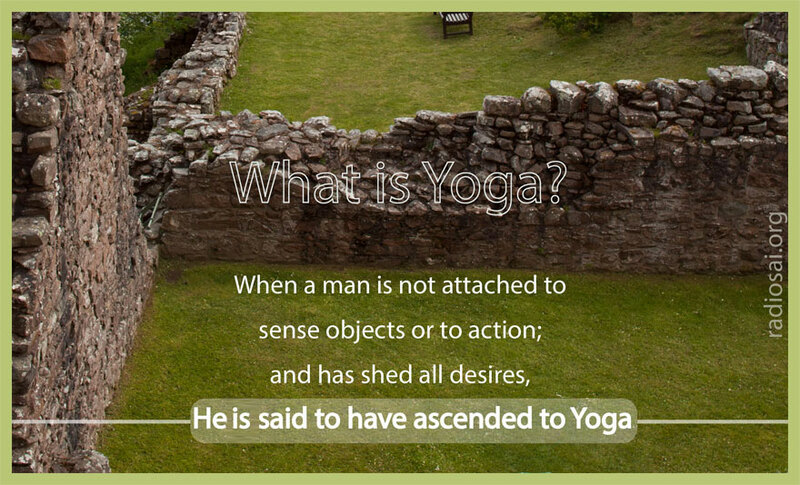 In the phrase Dhyana Yoga, there are two words, Yoga and Dhyana. Yoga is often confused with physical exercises called Yogasanas, while Dhyana is sometimes reduced to an exercise in stress relaxation. Yes, the formal discipline of Dhyana Yoga does call for the practice of Yogasanas and mental relaxation; but these are only starters. 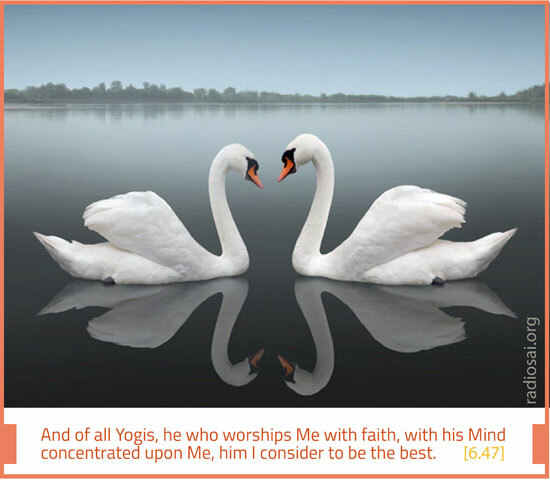 The real objective of Dhyana Yoga is different. It is because not enough attention is given to the real objective that some have been able to skilfully market Meditation and Yoga. In fact, these days Meditation has become almost an industry and a fashion, especially where the Corporate sector is concerned. What is this Mind we are talking about? What is the relationship of this so-called Mind to the senses? Why on earth should we exert to achieve this control? Suppose we do control the Mind and the senses, then what? Are there any fallouts, and are there any benefits? I would now like to briefly deal with these questions before I get into Chapter 6. Let me start with the Mind. This is a word we frequently use; in an intuitive way, we all understand or think we understand what this word Mind means. But do we really? I don’t think so, and so it is better we pause for a second to try and understand what we mean by this word. To appreciate the full meaning, it is useful to consider an analogy. Let us consider the sea and start with say the bottom. What we have there is lots and lots of salt water, with fish swimming around. Let us now go up until we come to the surface. There we would see waves, rising and crashing. Some waves would be big while others would be small. The water in the waves also is salty just as the water at the bottom, though the waves have a different form as compared to the waters below where there are no waves. Just above the waves, we have foam and above that salt spray. Some distance above the foam, the water exists in the air as small droplets and water vapour. The droplets are salty, while the water vapour, having come through evaporation is pure water. If we keep ascending into the atmosphere and go way up, we would not find any droplet, naturally; however, there would be water vapour for sure, having originated through evaporation. This vapour is in a gaseous state as opposed to the water which exists in the liquid state in the sea. The water vapour is pure H2O – no salt. 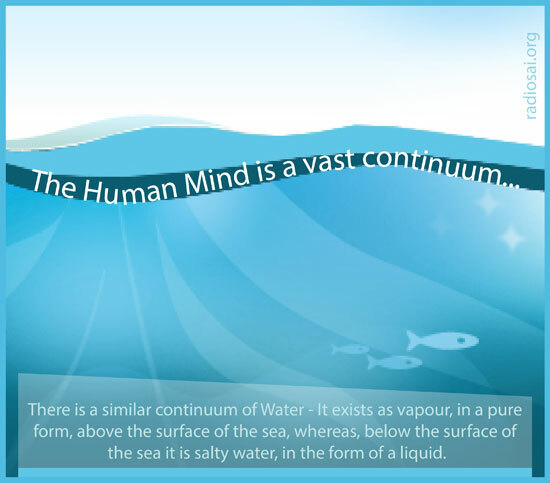 What this example teaches us that there is a continuum of water, with water existing as vapour and in a pure form way above the surface of the sea, as opposed to water existing as liquid water and with a lot of salt in it, way down below the surface of the sea. I have made a particular reference to this example because what we call the Mind is a similar continuum. Unless we understand that extensive nature of the Mind, we cannot really grasp what Mind and sense control are all about. May be all this is a bit puzzling, to say the least; so let me explain. You see, as I just said, the human Mind is a vast continuum. At one end, whatever the Mind does is just brain function; at this end, the Mind is strongly integrated with the body. Way at the other end, the Mind is far removed from the body, because it is immersed in the Atma. The Middle Mind is looking here and there. As Swami says, it is like a crow, which has the habit of looking in one direction for a short while and then looks the other way; it keeps on flitting all the while. 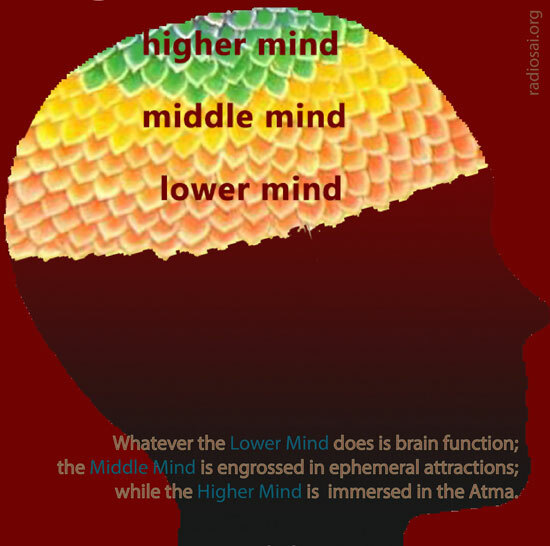 The Middle Mind is all the time looking into the world and following all sorts of ephemeral attractions. This would not do, if one is serious about Mama Dharma. If we want to make Mama Dharma the main objective of life, and that is what we really ought to do – that is what the Gita recommends anyway – then we have to rise above the Lower and the Middle Mind. That is what Mind and sense control is all about really. I am sure you have heard Swami say many times that the Mind can be a foe as well as a friend. In fact, Swami gives a nice analogy. 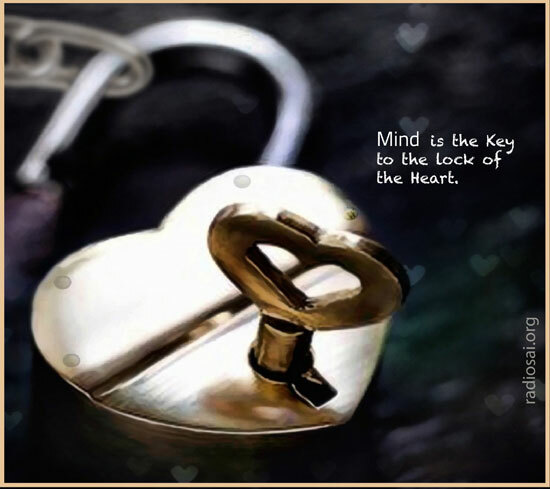 He says the Mind is like a key and the Heart is like a lock. If the key is turned one way, the lock opens; if it is turned the other way, the lock gets closed; that same thing was told by Swami to Arjuna five thousand years in slightly different language, as I have just pointed out. What is the signature of a man who has renounced and turned his Mind completely towards God? The Lord explains. 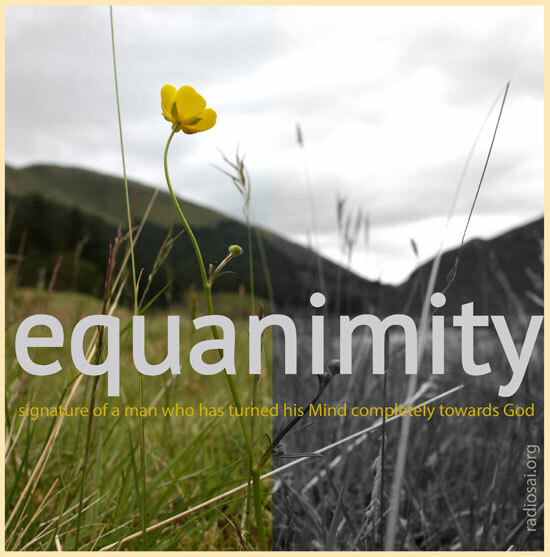 So you see, it is important to develop equanimity; no doubt corporate managers are all the time asked to develop this quality, but the Lord made clear five thousand years ago, that equanimity is even more important for one who is serious about following the spiritual path. One might argue that all this advice is fine as textbook material but impractical. In fact, Arjuna himself raised such doubts. Yes, tough it is, but not impossible. That is what the Lord asserts in the following set of Slokas. And now for some golden rules concerning the discipline that must be adopted to achieve renunciation, detachment, equanimity, etc. I hope what I have said thus far would make you appreciate that following the spiritual path is not a matter to be treated casually. I have to stress this because these days, people tend to live at such a fast pace that they are totally oblivious to the need for keeping some time for themselves for deep introspection and meditation. Laymen glibly talk about the Mind, without knowing what exactly the form and shape of the Mind is. Words like Mind, happiness and Bliss are abstractions which do not have existence in space and time. Nevertheless, they do subsist in a special sense. Though they do not exist in form, none can deny the fact they are real, individual experiences. The Mind is not an organ or a part of the body; it transcends the body. It is associated with Universal Consciousness. Men are accustomed to treat the Mind as a part of the body. This relates only to the sensory activities of the Mind. The Mind is made up of thoughts and doubts. But the Mind associated with the Divine Atma transcends the body. Consequently, it is only when the ordinary thought processes are extinguished that the Divinity within can be experienced. The Consciousness that goes beyond thought is a reflection of the Atma. Man is not aware of the potentialities of the Mind. The Mind is the cause of all our sorrows and joys. The powers of the Mind are indescribable. In one moment it can encompass the Universe. In another moment, it can be a total blank. It can blossom in one moment and wither in the next. The Mind is the cause of both good and bad. Mind is a sharp sword. Man will be able to fulfil himself if he realises the subtle and mysterious workings of the Mind. Mind travels fast, is strong, lighter than ether, and subtler than electricity. 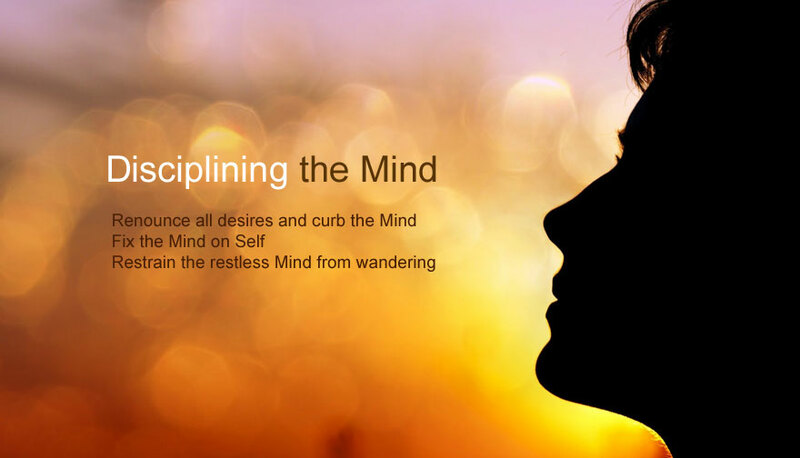 Man becomes an easy prey to sorrow and suffering by directing the Mind on questionable paths. Meditation means placing one’s Mind entirely in God. Meditation is required, because without placing our Mind in God, we would go astray in our actions. A man who meditates intensely is ever calm and unruffled; he is characterised by equanimity. To wrap it all up, yes, Mama Dharma is what the Gita boils down to. However, in practice, adhering to Mama Dharma means we must subject ourselves to a certain discipline. And that discipline, among other things, calls for Mind and sense control. The question might be asked: “Why on earth must we follow Mama Dharma?” That question would soon receive detailed attention. In brief, basically it has got to do with the fact that each one of us is a part of the Cosmos, which is Manifest Divinity. If Divinity is in every atom of the Cosmos, it follows it is immanent in each of us too. And if Divinity is immanent in each of us, it had better show up in the way we live. Surely we cannot afford to be Divine at the core and allow our Mind and senses to make us live like animals or devils, can we? And yet, is it often not the way people live today? How else did the much-talked about global warming problem crop up suddenly? Is it not due to the extensive air pollution caused by man? Does polluting the air God has given us so that we may live, constitute being in harmony with Nature? Is it not our duty to be in harmony with Nature? Is it not our duty to follow Mama Dharma?